I’m taking you back in time again with this post for another look at Clarendon Park’s past. This article follows on from my earlier Then & Now post and includes more photos sent to me by William Newton. 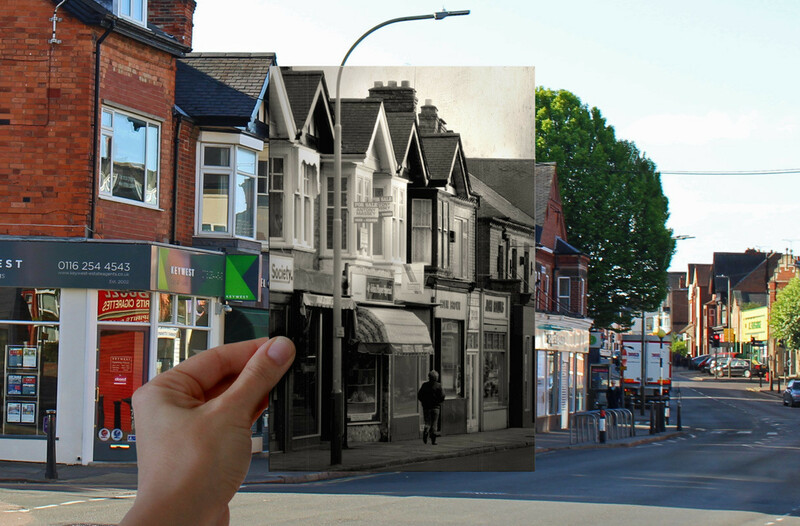 William grew up in Clarendon Park and documented many of the shops and other buildings of note in the 1980s and 1990s. Over the last few months I’ve been following in his footsteps and recreating these old photos to discover the changes that have taken place over the past few decades. 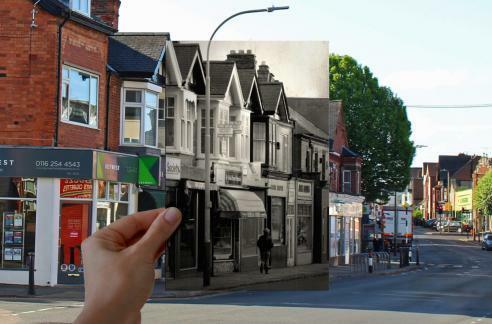 I hope you enjoy these photographs, and I’d love to hear your own memories of Clarendon Park’s past – share your stories using the comments box at the bottom of the page. In my previous article I asked you for your help identifying the modern-day location of a couple of William’s photographs. Thank you to everyone who got in touch and helped me track down the location of Queen Bee leather shop to 62 Queens Road, on the junction with Cecilia Road. 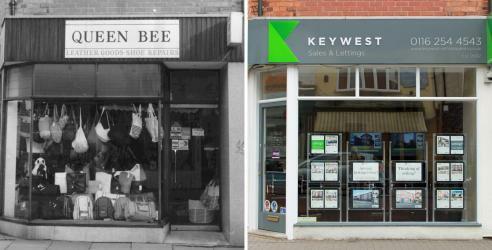 Until about six months ago this building was Groby Kitchens, but it’s now home to Key West estate agents. While researching 62 Queens Road (and by researching I mean putting the address into Google and seeing if anything interesting came up), I discovered a fascinating story about a 1917 plane crash which took place in Clarendon Park, involving this very building. A pilot lost control of his light aircraft and, after bouncing off the roof of number 62, came to rest atop the outside toilet of 31 Cecilia Road. Following on from the photo in my earlier article, here is another shot of the lovely Orlando Road. This one looks in the opposite direction, and was taken from near the entrance to the jitty that connects Orlando Road to Cecilia Road. 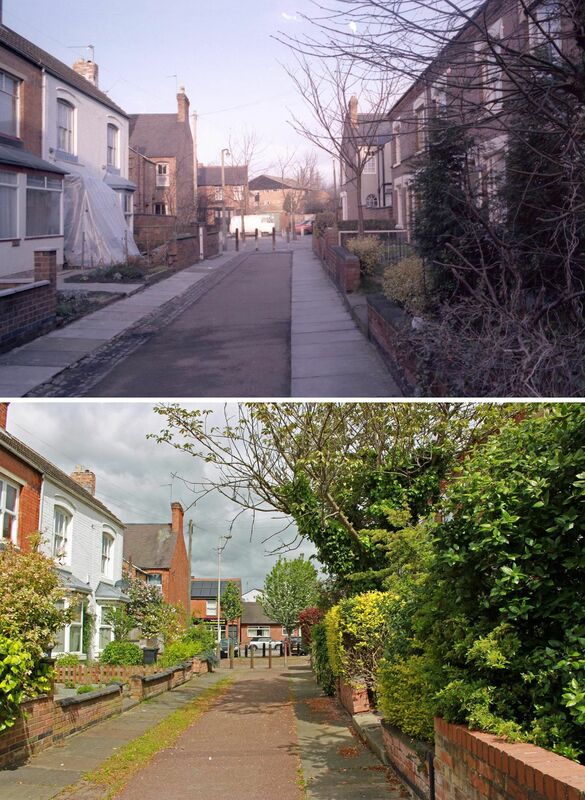 Orlando Road was originally named Holland Road, after William Holland, a bricklayer and contractor who built many of Clarendon Park’s houses in the late 1800s. Why the name was changed I haven’t been able to discover, but it may well have been to prevent it being confused with another Holland Road, not too far away in the St Matthews area of Leicester. Cecil Road was changed to Cecilia Road soon after it was built for a similar reason. William says he doesn’t remember getting any funny looks when he took this photo of The Lingerie Shop and I’ll take his word for it. 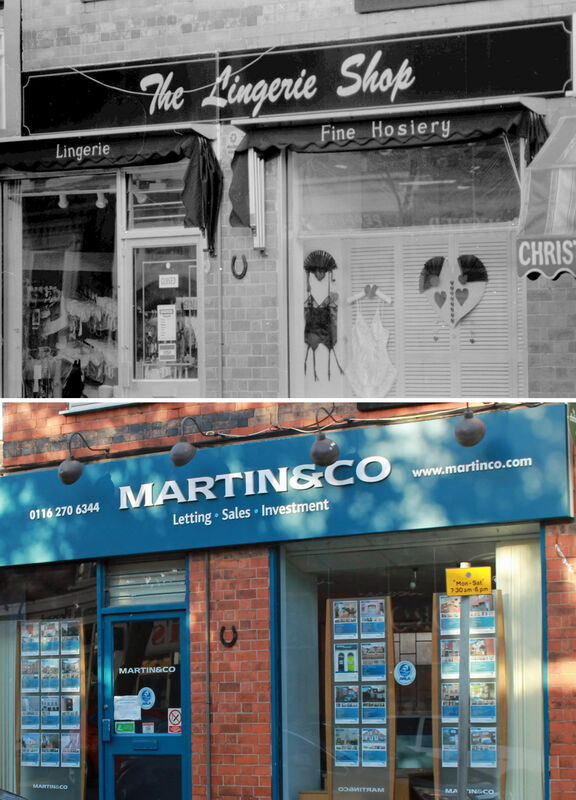 Perhaps the wares were a little risqué for Clarendon Park – the shop has had several other uses before becoming a franchise of national estate agents Martin & Co. I like the fact that the lucky horseshoe on the outside wall of the shop has remained in situ over the years. It took a fair bit of dedication on my part to take the photo on the right so please do take your time looking at it and drink in the full beauty of its modern photographic glory. After some time spent wandering around the parking bays on the west side of Queens Road, squinting into the distance and acting generally quite suspiciously, I tracked down the correct viewpoint to a bollard outside LOROS By Design, considerably further away from the subject than I’d anticipated. Unfortunately, there were several cars spoiling the view. Several fruitless trips to The Bollard followed, until I finally got a car-free photo by stopping by at 7.30am on my way to work. Dedication. 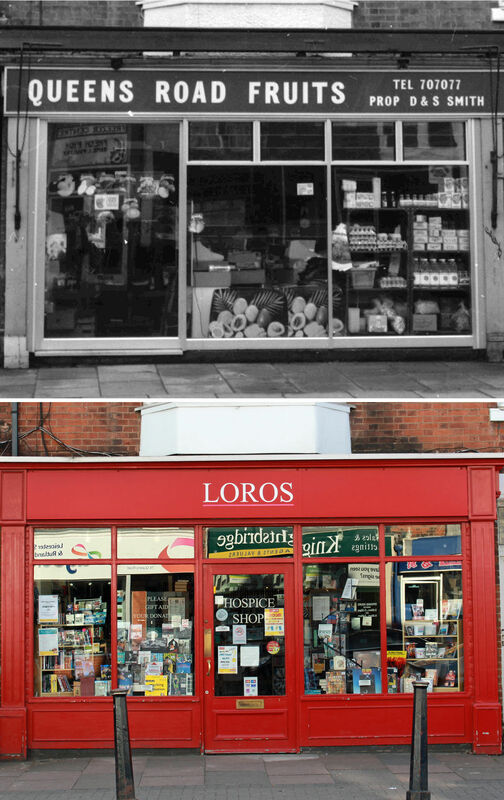 Back to the photo, and every single shop shown in it has undergone a dramatic change of use. The Hair Studio, which is towards the left of the photo behind the lamp post, is now Queens Tandoori. Next door, the General Store has become Andersons’ Sweets and Ice Cream, and further along, Colin Brown is now Knightsbridge estate agents. Finally, John Collins fishmongers is now Age UK charity shop – you can see the changes to this shop in more detail in the next two photos. 74 Queens Road had been a fishmongers since the 1920s and, while John Collins is no longer trading, the legacy of the company’s work lives on. Fishmonger Fred Gibson has worked at Leicester Market since the late 1950s and learned his craft while employed by John Collins, both at the market and at the Queens Road shop. You can find out more about Fred’s story on the Leicester Market website. No real differences of note here, unless you have a penchant for scaffolding or the evolution of the area’s parking restrictions. Still, seeing the relatively unchanged appearance of Queens Road’s residential houses really demonstrates just how dramatically the retail units have altered by comparison over the same time period. Here we have another food retailer that has been replaced by a charity shop. In both photos you can see the reflections in the windows of the shops immediately opposite. 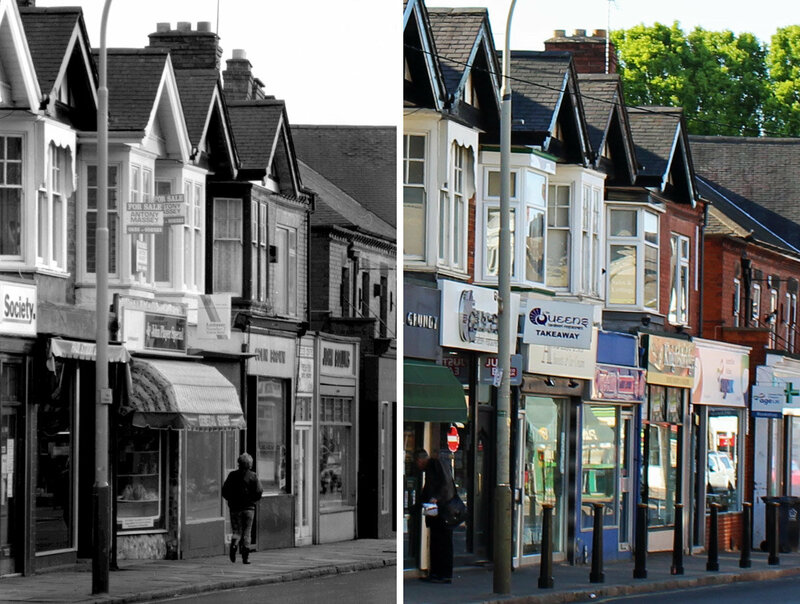 It was by matching up the reflections in the old photos with the reflections in the windows of the current shops that I worked out the correct location of Queens Road Fruits. Do you have a mystery that you’d like solving by a nosy parker with an interest in local history and mediocre observation skills? Get in touch using the comment form at the bottom of the page. This photo is a bit of an imposter, as it wasn’t taken by William and is considerably older than the others here, but I’m keen to share it with you and this seems like the appropriate place. I discovered it in the University of Leicester’s Special Collections Online. This is a wonderful trove of digital resources, well worth a browse, consisting of photographs, historical directories and all manner of ephemera from the archives of the University’s David Wilson Library. Many of the images, including this one, have been dedicated to the public domain, making them freely available for others to use and share. The view is of the corner of Queens Road and Montague Road. 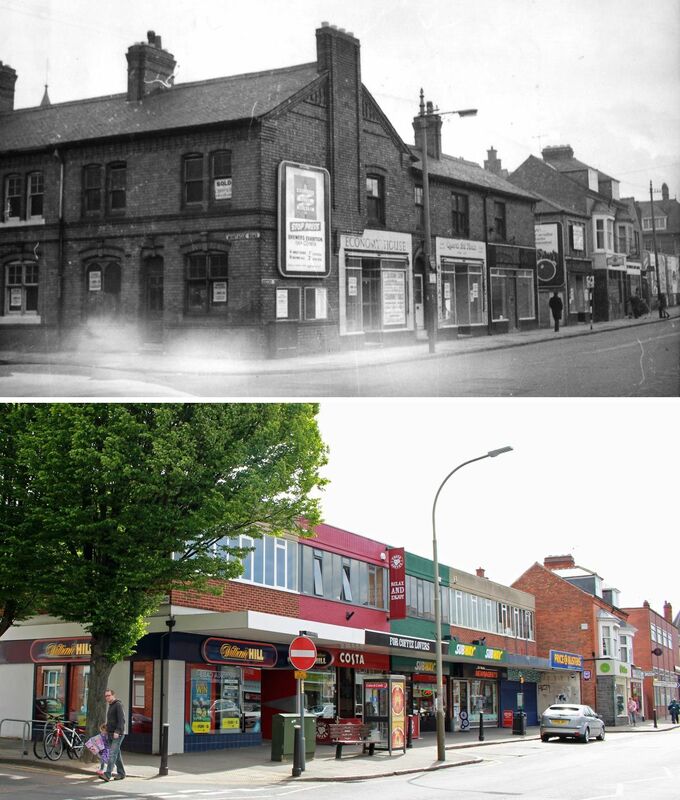 The building which fills the majority of the frame on the first photo has since been demolished and replaced with the more modern block of purpose-built shops, which are set considerably further back from the road to incorporate a wider pavement and the bus stop. The corner is barely recognisable at all but take a look at the chimneys and frontages of the buildings to the far right of the photos and you’ll see that they were indeed taken from the same viewpoint. The handy brewery advertisement on the side of the big building dates the earlier photograph to 1964. The shop closest to us has a sign that reads ‘Economy House’ and is promoting a clearance sale. Meanwhile, next door, Queens Road Florists advertises ‘wreaths and bouquets’. The demolition of this old building must have been quite newsworthy at the time. Does anyone remember the event? 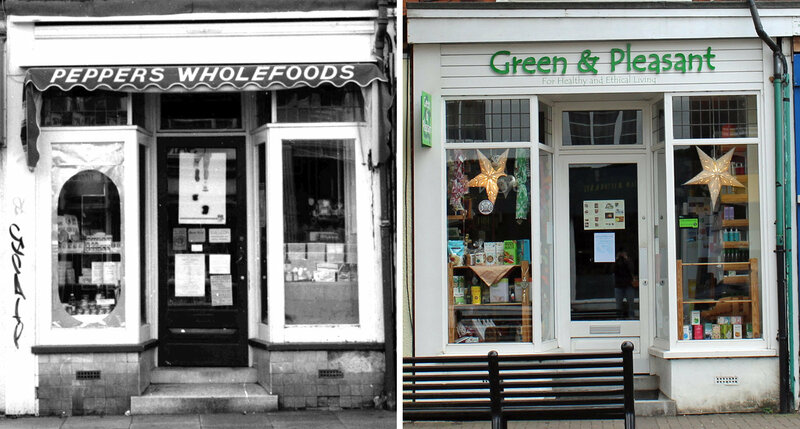 The attractive building which is currently home to Green and Pleasant has clearly been a whole foods shop for some time judging by this photo. I’m a big fan of G&P – for a small shop they stock a huge range of specialist and niche foods, drinks and toiletries at really competitive prices. They are also big supporters of small local suppliers, stocking locally produced items as diverse as handmade cheese, organic soap and even honey made by Clarendon Park’s very own bees! The imposing building on the left was built in 1889 as St John’s School. 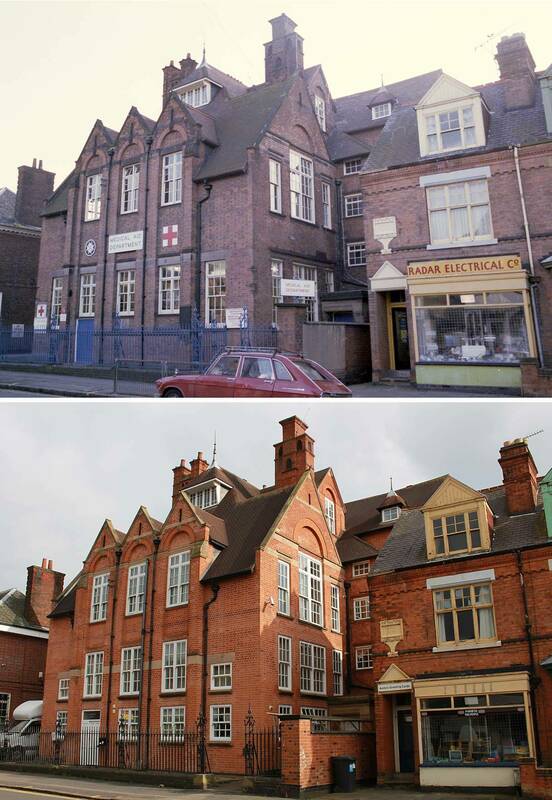 This church-run school was the only one in Clarendon Park until 1894, when the larger Avenue Road Board School was opened by the Leicester Authority. In 1974 St John’s School packed up and moved to nearby East Avenue, where it’s been ever since. Soon after the building was vacated it was bought by the Red Cross, and it was still being used by them when William took his photo. 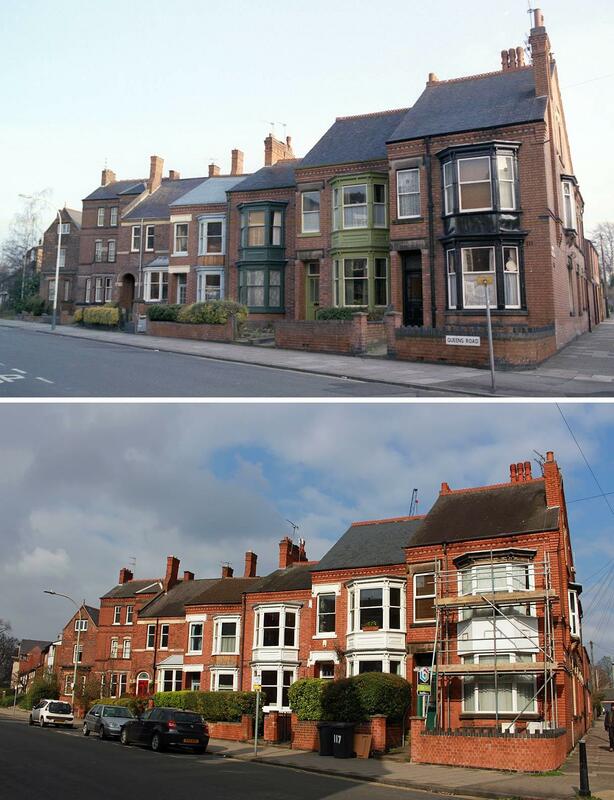 It has since been purchased by a developer, renamed Madeleine House, and repurposed into 13 individual apartments. According to the folk at the Stoneygate Conservation Area Society (SCAS) the conversion has been extremely sympathetic, with a lot of time and money having been spent on the repair and retainment of the building’s original features. Take a look at this article in the SCAS newsletter from May 2010 for more information and photographs of the conversion. 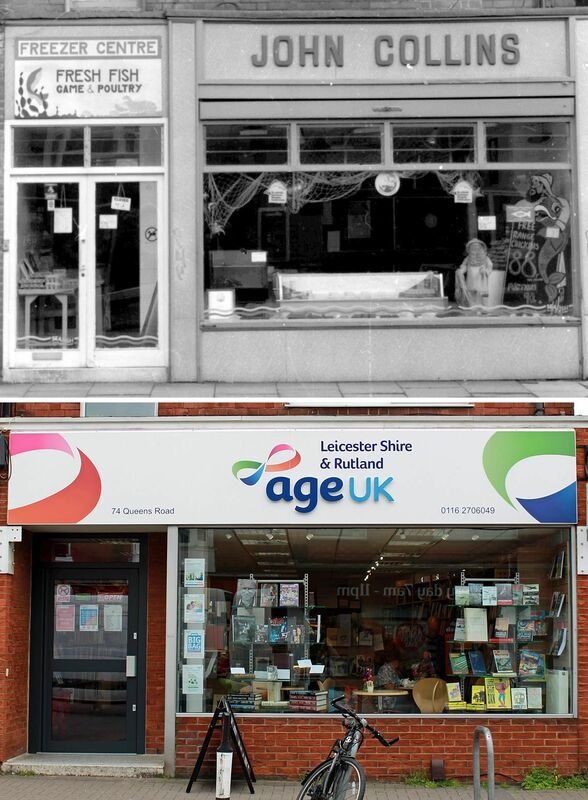 Brilliant – what a classic example of great customer service! Past vs present, love these photos! Love looking at all these photo’s. Brings back so many memories. I went to St. John’s school in the 50’s and lived on Lytton Road. So many changes. My grandmother lived. On South Knighton Road. Thank you Angela – I’m so glad you’ve enjoyed the photos. I remember waliking down Queens Road from College Hall to Uni everyday in 1980 and remember some of the buildings including Nando’s barber (or butcher depending on your viewpoint). I also fondly remember the chippy after a few beers on the walk back to College Hall. This is a great piece of local history. Thank you David – a well placed chippy is a beautiful thing indeed!